Desert Island Singles: “Lovesick Blues” by Hank Williams and His Drifting Cowboys (1949) | Name-Brand Ketchup. ← No need to be shy about it. This is by far the oldest song I’ve nominated as a Desert Island Disc. The previous record-holder was from 1966. When I was a snotty know-it-all country music-hating fourteen-year-old, if you had told me that one day I would admire a Hank Williams song this much (or at all), I would have laughed in your face. Funny what a difference forty-some years can make. But this is a remarkable song, which shows the ingenuity of Williams and the timelessness of this song (though it was published the year before Williams was born). Williams decided to record the song just before Christmas 1948, over the protests of his band and record producer. Its release was delayed till mid-February 1949, due to some uncertainty over the song’s publishing rights: Williams told his producer that he bought the rights from Griffin. The single sold 50,000 copies in the first two weeks, quite an accomplishment in 1949. It was Williams’ first number-one hit on Billboard’s country-western charts, where it remained for sixteen weeks. 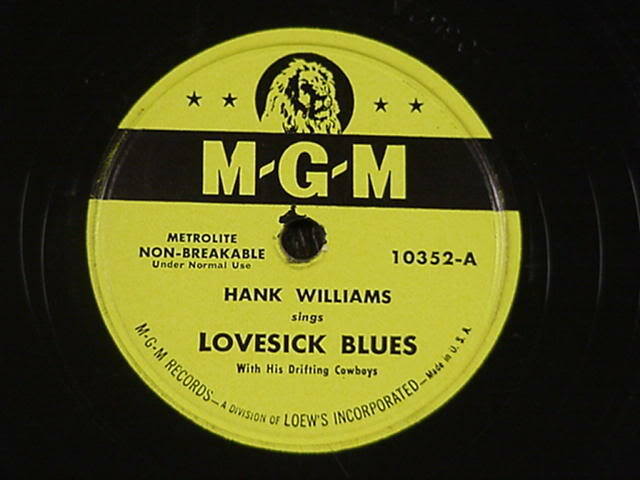 “Lovesick Blues” became Williams’ signature song, which he used to close his shows. It also garnered him the stage nickname of “The Lovesick Blues Boy.” On its strength Williams made his debut at the prestigious “Grand Ole Opry” on June 11, 1949, where he became the first performer to receive six encores. He remained with the Opry till 1952. In 2004, “Lovesick Blues” was added to the National Recording Registry by the Library of Congress. It’s been covered by dozens of artists including Patsy Cline, Kitty Wells, Linda Ronstadt, Slim Whitman, Glen Campbell, Merle Haggard, Charley Pride, Jerry Lee Lewis, Little Richard, and LeAnn Rimes. With the heartbreak in his masterful delivery and the tight performance of the Lonesome Drifters, Williams turned a cast-off song from a forgotten musical into a classic of country music. A Desert Island Single to be sure.